Let the kids go crazy in the pool, waving them over for the occasional sun-check or goggle-adjusting. Waiting for the late sleepers to make an appearance? You're just a sliding glass door away from the ocean air. Get up early and head for the gym, or hit it while the rest of your crew goes in for an afternoon snooze. Al fresco dining options abound. Check out the service menu at the posh onsite spa. Your kids will love the children's club and the kid's area by the pools. You're just a 5 min drive away from Flamingo's Golf. Whether you’re lounging in a floppy straw hat by the pool or feasting on fresh catch straight from the Sea of Cortez, keep an eye out for entertainment world A-listers. Villa La Estancia Beach Resort and Spa has a way of attracting the star-studded crowd. Feel like a starlet yourself after a day of pampering at the rejuvenating Desert Spa. Perched at the tip of the Baja Peninsula, surrounded by mountains and mesmerizing ocean vistas, the 31,000 square foot escape offers an exclusive line of desert-inspired body treatments just begging to be booked. Luxurious vacation villas include a pillow menu, bathrobe and designer bath amenities, plus an open-plan kitchen with granite countertops and stainless steel appliances. Work your own culinary magic or hire an in-room private chef. Dine or just kick back on your oversized private balcony with breathtaking ocean or garden views. Got some golfers in your group? 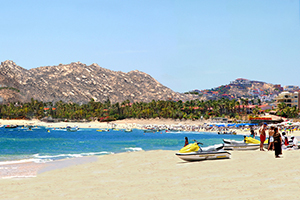 Los Cabos has eight courses, two of which are rated among the world’s top 50. Onsite championship tennis courts are open 7:00 AM to 7:00 PM, so head over early, leaving time for a fun excursion. Surprise your crew with horseback riding along the beach or a sunset cruise out on the water. - Restaurants from Villa del Arco, Villa del Palmar and Villa La Estancia for breakfast, lunch, dinner and theme nights at Villa del Palmar. - Water, soft drinks, coffee and tea (alcoholic beverages are not included in the plan). - A 40% discount applies for menu items marked and Premium on restaurant menus. - A 40% food discount applies for private Sunset Dinners on the beach. - A two-dollar delivery fee applies for room service. - A 25% discount applies for private chef services in your room. - Tax and service are included. In you wish to reward extraordinary service, please do so directly with the server. - All restaurant checks require your signature. Hotel will advise you when an extra charge applies. - Meals must be consumed in the restaurant where they are ordered and may not package to go. - Guided kayak outings leave from Villa del Arco’s beach at 2:00 PM and 3:00 PM daily, on a first come-first served basis. - Guided paddle board outings leave from Villa del Arco’s beach at 10:00 AM, 11:00 AM and 12:00 PM daily, on a first come-first served basis. - Alcoholic beverages, Palmita Market products, Ice Cream Shop products, Phone Calls, Spa, Childcare, Ground Transportation and laundry. - An additional charge may apply for holidays or special events. - Due to limited space and high demand, the use of the pools, beach and poolside lounge chairs at Villa del Arco are strictly limited to registered Villa del Arco guests.